Time again for the monthly Nerd Block Classic review. With it being October, these are all horror/monster-themed, so let’s take a look. First up, we have an exclusive art print. 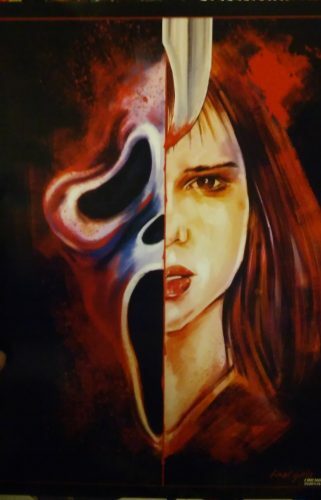 As you can see, it’s a mash-up of Ghostface and Sidney Prescott from the Scream movie series. I am not sure what I want to do with this just yet. On one hand, the movies mean absolutely nothing to me. On the other, it’s a cool drawing and would look nice in a frame. I may keep it…for now. Up next…ugh, stuff from The Walking Dead. It’s essentially a coin purse designed to look like a disembodied ear. 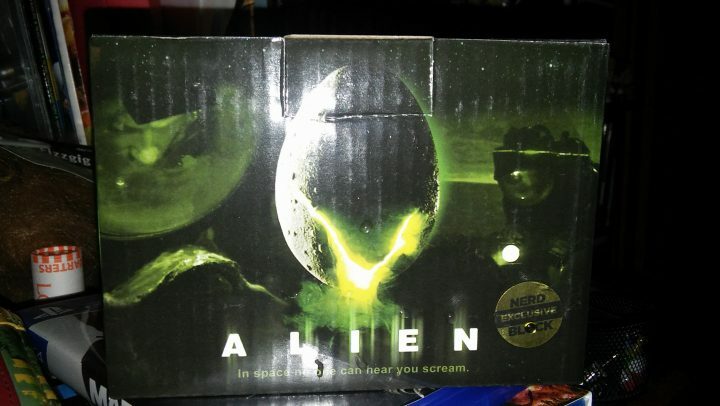 This is now the second item from the franchise I’ve gotten in one of these boxes made to resemble disembodied ears (the first was in a Loot Crate, and it was soap-on-a-rope. Stupid item, and the soap smelled like mouldy arse). My hatred for this show runs deep, so I probably won’t keep this. A good friend of mine is a fan, however, so maybe I’ll send it to her. Now we’re getting somewhere. 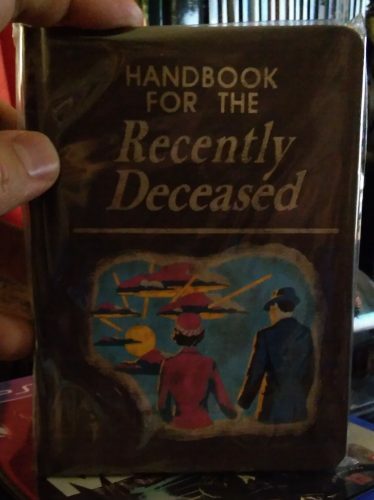 This is a journal designed to look like the famous book of the same title from the film Beetlejuice. Beetlejuice was one of my favourite movies as a kid, and one I still watch & enjoy nearly 30 years later. I probably won’t use it much for writing (I actually hate writing with my hands at this point), but it’s a nice little collectible and one that will look good on the bookshelf. Alright, moving on. It’s some goodness from the original Ghostbusters franchise. Toys and figures are almost always an automatic win with me in these boxes. I love Ghostbusters so this figure of Ray Stantz covered in slime is a win. I am just slightly bummed, however. For some reason, my Nerd Block came slightly smashed, and this collectible was the sole casualty. 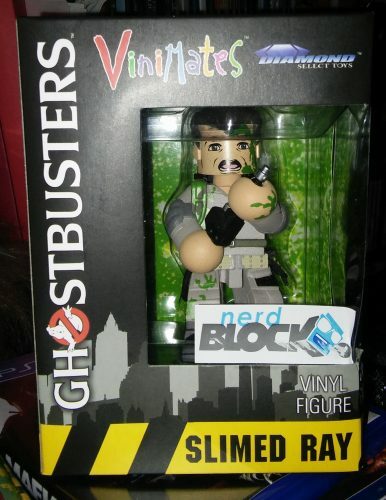 You may not be able to see it in the photo, but there is a dent by the “Nerd Block” sticker, so the collector value automatically takes a hit. Now, I had no intention of selling this anyway, but still. I prefer the packaging to be in the best shape it can be, so I’m a little sad. Oh, well. C’est la vie. It’s a cool collectible regardless. Looks like we’ve got another Alien item this month. The front of the box doesn’t tell you what’s inside (the back does, however, but what’s the fun in that? ), so let’s open it up and take a closer look. 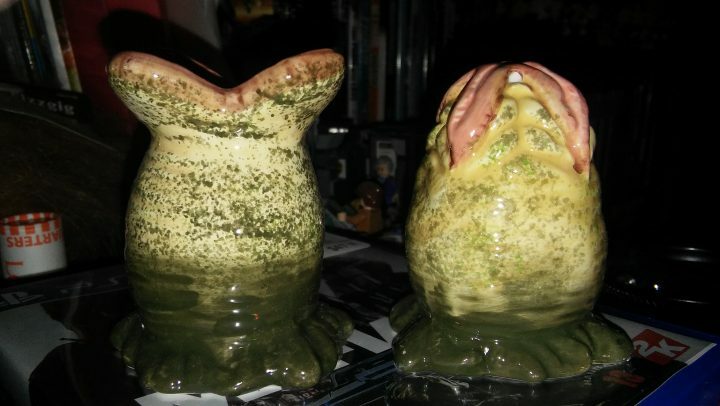 This would be a salt and pepper shaker set, and a badass one at that. Much cooking is done in this house (namely by Yours Truly), so I can promise these will get used extremely regularly. They’re nice quality, too, being ceramic instead of plastic or vinyl. It’s “Treehouse of Horror” from The Simpsons, which is very fitting for the month. 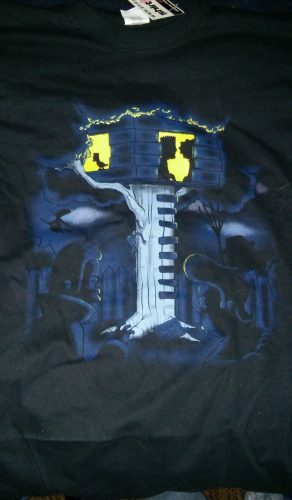 I love The Simpsons (up through around season 12, at least), and this is honestly only the second or third shirt from the series I’ve ever owned. In fact, it might be the only one I have left, the others being lost to time (getting worn into oblivion). I get that black is a good colour for Halloween, and it fits with the design, but I really wish they would have gone with another colour. Like I said in my last Firefly Cargo Crate review, I am really tired of black t-shirts and own way too many of them. Still, a minor complaint. It’s a nice shirt and will find regular rotation in my closet. Well, this month was a bit underwhelming. Some good stuff in here for sure, but the overall quantity was disappointing. Maybe it just seems like there have been more items in previous boxes, but I’m pretty sure there were. Regardless, the stuff I do like in here, I like a lot, so I guess that makes it a win. 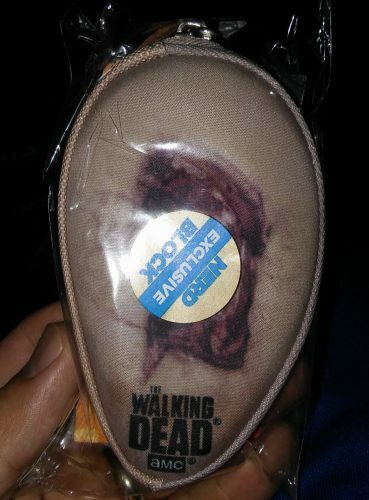 I could go without seeing anymore TWD items, however. That’s it for this month. Next month, I will be looking at items from Deadpool, Bob’s Burgers, The Nightmare Before Christmas and The Lord of the Rings. See you then!